The Blue Jackal and other tales are stories that children would hear from their parents and grandparents, each storyteller relating his or her own version. In this beautifully illustrated hardback book, these fables are re-told in a simple language that children can understand and enjoy. This audiobook is narrated by Timothy Knapman. Once upon a time there was a good king who had three very lazy sons. As he grew older, their father began to despair. He wondered how he would ever succeed in educating his sons so that, when the time came, one of them could take over the rule of the kingdom. Experts came from far and wide to give advice, but the spoilt young princes would not listen to any of them. At last a famous wise man arrived at the court and offered to teach the princes by means of instructive fables. So charming were these stories, so full of wit and wisdom, that the king’s sons were captivated by them and in time began to learn the lessons they taught. In the tales, animals could talk and had human feelings, and the same failings as humans too. They displayed arrogance, greed and cowardice, but also intelligence, bravery, and above all, loyalty to their friends. Courage, honesty and quick-thinking were rewarded, but animals that were greedy or dishonest always came to a bad end. Other stories in this collection come from places as far apart as Morocco, Iraq and the Punjab. They are tales that children would hear from their parents and grandparents, passed down through families, each storyteller relating his or her own version. 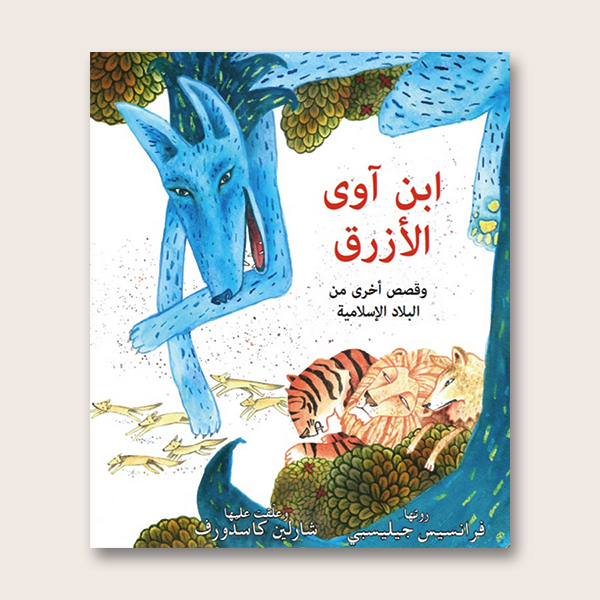 In The Blue Jackal these fables are re-told, in simple language that children can understand and enjoy. They are beautifully illustrated by Canadian artist Charlene Kasdorf. The author was inspired to make this collection of tales by the animals depicted on the glorious works of art on display in the Museum of Islamic Art, Qatar. With the support of Occidental Petroleum of Qatar Ltd, these delightful fables, which have been handed down from generations around the world, are now brought to a new audience.